The Germany international has made nearly 100 appearances for Bayern since his move from Borussia Dortmund in 2016 but his position with the club has recently come under question. 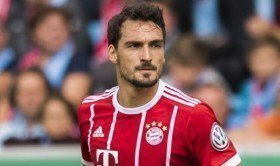 According to Bild, Hummels is currently unsettled with the Bavarian giants amid the regular rotation policy from manager Niko Kovac and this may urge him to seek a fresh challenge elsewhere. It is added that both Chelsea and Spurs have have made contact with the player's agent Marc Kosicke regarding a possible move at the conclusion of the ongoing campaign. The Blues are likely to spend on another central defender with the future of David Luiz uncertain while the same goes for Spurs with Toby Alderweireld widely fancied to part ways with the club next summer.